Arasi Paruppu Payasam | Happy Gokulashtami/Krishna Janmashtami!!! Payasam is a mix of Rice, Jaggery and choice of Dal. Here I have used Channa Dal/Kadalai Paruppu, its very aromatic and tasty. I have posted few payasam varieties here. I prepared this for Avani Avittam Festival on Saturday. It was perfect and everyone liked at my home. This recipe was taught by my Mother in Law, Thanks a lot. Wish you all a very Happy Gokulashtami!!! Wash, rinse rice and channa dal. Pressure cook upto 3 whistles with water. In a vessel, add vellam/jaggery with 1/2 cup water and allow it to dissolve. If required add more water, once its fully dissolved, filter it and again start boiling in low flame on occasional stirring till the raw smell of Jaggery goes. Grind the coconut and rice with little water to fine paste. Once the pressure is gone, take the rice and dal mix and mash it with a laddle/karandi. Add the rice, dal mix to the jaggery, coconut paste and mix well. Heat ghee in a pan, add cashews and raisins. Fry till brown and add to the payasam. Delicious Payasam is ready for Neivedyam and Enjoy it warm or chill!!! 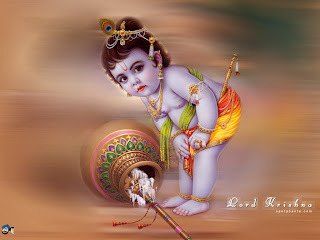 Once again wish Happy Gokulashtami to all friends celebrating the festival. Until my next post. Happy Weekend. Rich, creamy and delicious payasam..